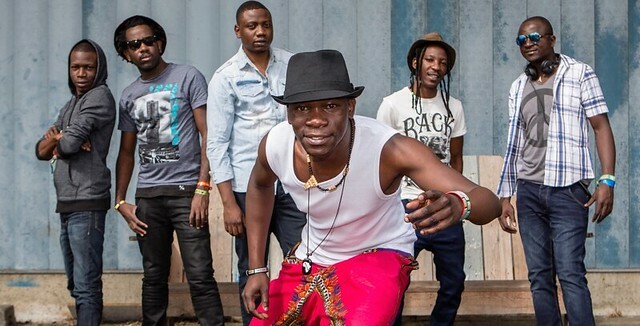 Mokoomba is an ebulliant young band from Victoria Falls, Zimbabwe making a big splash on the international scene with an electrifying blend of Afro-rock, traditional sounds and lots more. They're on the road now in support of an excellent new album, Luyando (Out | here Records). 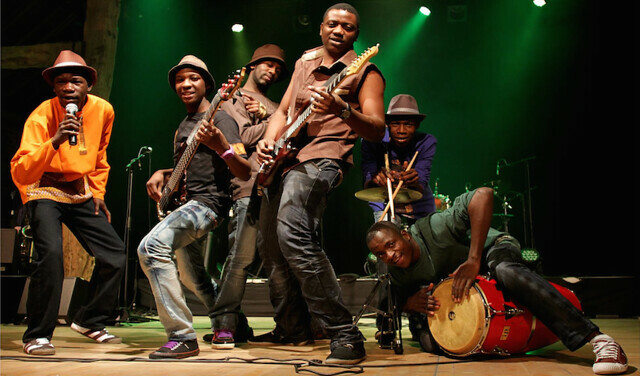 Mokoomba's US tour includes a stop at The Falcon up in Marlboro NY on Wednesday night May 17th. After hitting a few more clubs and festivals stateside including the The LEAF Festival in Black Mountain, North Carolina and the Joshua Tree Music Festival in California later this month, they'll be storming the vaunted European summer festival circuit. But first - with huge thanks to our illustrious engineers Manny Yupa and Bobby Shock (of Crust!) plus Alison Loerke of ALIA Productions and Tom Pryor - we're thrilled to bring Mokoomba to the Garden State airwaves for tonight's live WFMU session! Top photo c/o Out | here Records. Bottom photo by Strange Milena, SOFAM, Belgium. TICKET GIVEAWAY TONIGHT to see sitar great SHUJAAT KHAN! We have one pair of tickets available to see Indian sitar virtuoso Shujaat Khan in a concert presented by the World Music Institute (WMI) at the Miller Theatre, 2960 Broadway at 116th Street, Manhattan, 2960 Broadway at W116th Street in Manhattan, this Friday night, May 12th at 7:30. Concert info c/o WMI here. To get in the running for a pair of tickets: Email me, Rob W, here, and please put the word "TIX" in the subject line. The deadline to enter is tonight at midnight. Winner will be notified by Monday. Thanks and good luck! Shujaat Khan is a sitar virtuoso whose musical pedigree extends seven generations. He is the son and disciple of the great sitarist Ustad Vilayat Khan, nephew of Imrat Khan, and a member of one of the oldest and most prestigious musical families and schools of India – the Imdadkhani Gharana of Etawah. Khan was the featured artist at musical concerts celebrating India’s 50th anniversary of independence at Carnegie Hall, Paramount Theatre in Seattle, and Meyers Symphony Theater in Dallas. The Rain, an album featuring Shujaat Khan and the Indo-Persian Ghazal ensemble, was nominated for a Grammy Award for “Best Traditional World Music Album”. For this concert, he will be joined by Samir Chatterjee on tabla. More info on the World Music Institute’s excellent ongoing series of international concerts around NYC at http://worldmusicinstitute.org. "They are talking about me..."
GIG: Giveaway: Friday night at the Miller Theatre, concert produced by World Music Institute - instructions on how to enter the drawing for a pair of tickets are on this page! National Immigration Law Center: Established in 1979, the National Immigration Law Center (NILC) is one of the leading organizations in the U.S. exclusively dedicated to defending and advancing the rights of low-income immigrants. National Immigration Forum: The National Immigration Forum is one of the leading immigrant advocacy organizations in the country, with a mission to advocate for the value of immigrants and immigration to the nation. New York Immigration Coalition: The New York Immigration Coalition aims to achieve a fairer and more just society that values the contributions of immigrants and extends opportunity to all. The NYIC promotes immigrants’ full civic participation, fosters their leadership, and provides a unified voice and a vehicle for collective action for New York’s diverse immigrant communities. Arab American Family Support Center (New York City): The Arab-American Family Support Center is a 501(c)3 non-profit, non-sectarian organization that provides culturally and linguistically sensitive services to immigrant communities throughout New York City. Action NYC: ActionNYC connects New Yorkers to free, safe immigration legal help. You can make an appointment to learn your immigration legal options and get immigration application assistance. There are ActionNYC sites in all five boroughs. Appointments are required. Your appointment will be in your language. Immigration Equality is the leading LGBTQ immigrant rights organization in the country. It provide s advice and legal services to thousands of LGBTQ and HIV-positive immigrants seeking refuge, fair treatment, and freedom in the United States. The work is truly lifesaving because there are nearly 80 countries around the world where it is a crime to be LGBTQ, with consequences up to and including the death penalty. For this reason, Immigration Equality fights to obtain asylum in the United States for LGBTQ and HIV-positive refugees - with a remarkable 99% win rate. International Refugee Assistance Project: The International Refugee Assistance Project (IRAP) organizes law students and lawyers to develop and enforce a set of legal and human rights for refugees and displaced persons. Mobilizing direct legal aid and systemic policy advocacy, IRAP serves the world’s most persecuted individuals and empowers the next generation of human rights leaders. Asian American Legal Defense and Education Fund (AALDEF): AALDEF is a national organization that protects and promotes the civil rights of Asian Americans by combining litigation, advocacy, education, and community organizing. Issues / focus include immigrant rights, civic participation and voting rights, economic justice for workers, language access to services, educational equity, housing and environmental justice, and the elimination of anti-Asian violence, police misconduct, and human trafficking. Make the Road New York (MRNY): MRNY builds the power of Latino and working class communities to achieve dignity and justice through organizing, policy innovation, transformative education, and survival services. Make the Road New Jersey (MRNJ): Make the Road New Jersey builds the power of immigrant and working class communities in New Jersey to achieve dignity and justice through community organizing, legal and support services, transformative education and policy innovation. Outstanding start. Looking forward to the sounds of Zimbabwe later. Thanks and good evening everyone, thanks for listening! My Colombian wife and I are loving this intro. Thanks Rob! Hey Rob! Thanks for providing great music to write to. Just got back from an Indonesian food fest in an Episcopal church in Elmhurst, Queens. Tasty stuff! Although I bet it would've been even better if it were a Zimbabwean food fest, but I don't think we ever get any of those around here! Looking forward to Zimbabwean sounds! Ah yes well I can't make those Sat. Indonesian food fests but happily there are Sunday Indonesian food fests in Elmhurst too, at the Indonesian mosque - I went to one a couple of weeks ago! They went to eat Zimbabwean food in the outer boroughs? Where was that, any idea? I'm afraid it was a private Zim-food-fest - friends from Zimbabwe cooked for them! Oh well! Hey at least there's a new Burmese restaurant in Brooklyn! It's in Bensonhurst of all places. Haven't been yet. Oh and as for the Masjid Al-Hikmah fest, a couple of weeks ago was probably one of the best possible times to go there. I think they do it once a month in the warmer months (excepting Ramadan), but you don't want to do it when it's hot outside -- that little parking lot is in the direct sunlight and totally boils. Thank you Mokoomba! Great set! Hey,Rob and citizens of paradise! I love your show, Rob! Thanks for yet another great show Rob! wonderful show, Rob! Mokoomba are AMAZING! LMAO @ "I know my playlist looks like a Dr. Bronner's bottle".